Helen – Monday, Monday!!!! We didn’t walk around the lake because our legs were still wobbly. So after coffee and toast (our cupboards were bear because we went away), Tom went to the office and didn’t return until 7:30. Meanwhile I went grocery shopping but took the three wheeler home with all the bags!!! Next was laundry and cooking and before I went to bed I had to work on the Fitness Walking presentation on the computer since Tom takes it to school every day and I don’t have a chance to work on it when he is not here. Tom – I took a picture of a laundry establishment today. 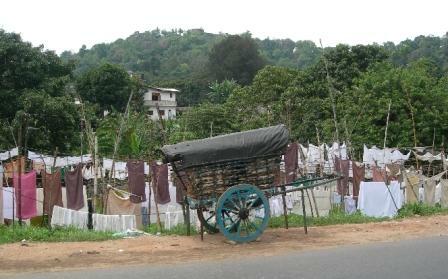 Note the clothes lines and the wagon full of fire wood that is used for heating the water. 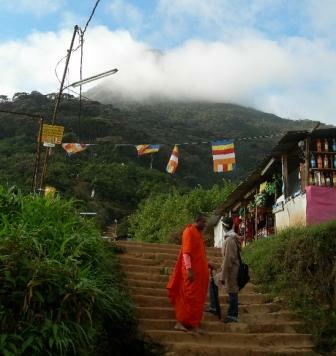 Tom – Sri Pada or Adam’s Peak (7,359 ft) is a sacred site for the world’s four major religions. 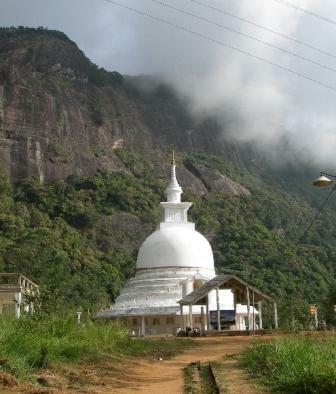 Sri Pada means Holy Footprint in Singhalese and there is a stone footprint now enclosed in a temple on top of the mountain. 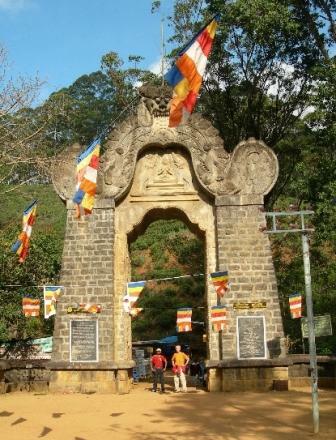 According to the Buddhists this is the sacred footprint of Buddha as he headed for paradise. 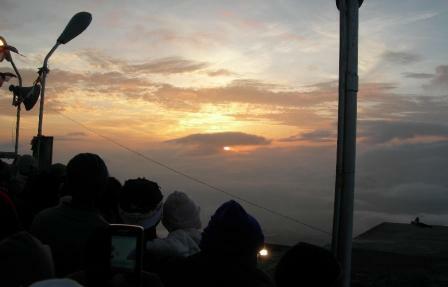 The Hindus believe it is the footprint of Lord Shiva. According to Muslims and some Christians, it is where Adam first set foot on earth when he was cast out of the Garden of Eden. 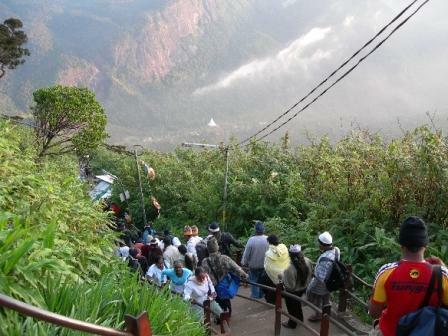 So, all four religions have pilgrims going up the mountain. 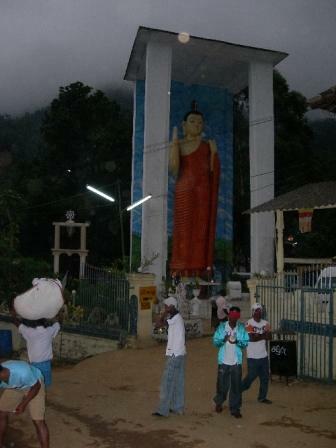 The pilgrimage season is from Poya Day (full moon) in December to the Vesak festival, which is a two day Poya festival that commemorates the birth, enlightenment, and death of Buddha in May. 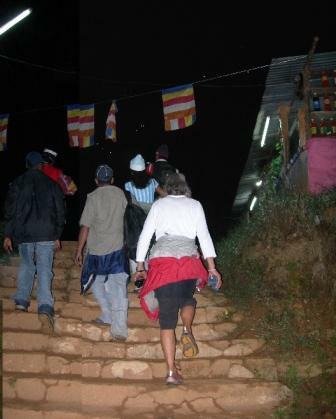 During this period the fluorescent lights spread out along the trail are lit all the way up the mountain. We didn’t even need our headlamps! We were up at 2am and on the “trail” at 2:15. Early on we gave a monk at a Buddhist shrine a donation for a blessing/chant and the tying of a white string around each of our right wrists. We also had to make a wish and ring a bell. The trail/stairs where easy early on but as we moved higher the stairs became continuous. The stones and stairs are not regular and range in height from about five inches to more than a foot so you had to be careful with each step. 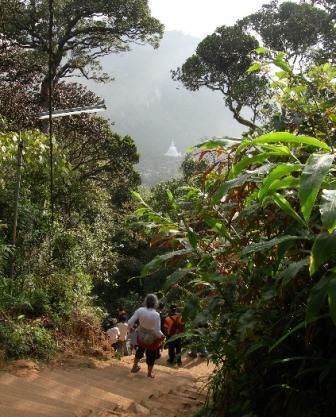 The trail/stairs route is 4.5 miles to the summit with a vertical ascent of 3,280 ft. There were railings on the very steep sections near the top which really helped. We only carried our Gore Tex suits and a long sleeve top for the climb. When we reached the top (5:15am), we put on our Gore Tex jackets and that provided sufficient protection while awaiting the sunrise. No need for any supplies because there are “rest houses” and concessions all the way up the mountain! We again rang a bell on top and then filed passed the sacred footprint depositing an expected donation. 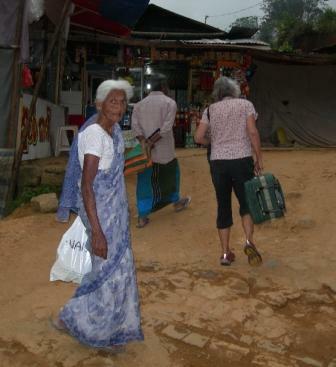 Irene (maid at Ruki’s in Colombo) had given me a 50 rupee bill that she wanted me to donate for her as well. It was somewhat cloudy in the east but we were able to see the sunrise before it clouded in and prevented us from seeing the famous pyramid shadow on the west side of the mountain that races back toward the mountain as the sun rises. We reached our guesthouse at 9:00, showered while breakfast was prepared and ate outside in the small front garden overlooking the start of the trail. Brenda said that our 3 hours up and 2.5 hours down was pretty good and that most people take much longer, however, she can still get to the top in 3.5 hours barefoot!!! She is really one spry lady with a lot of energy. 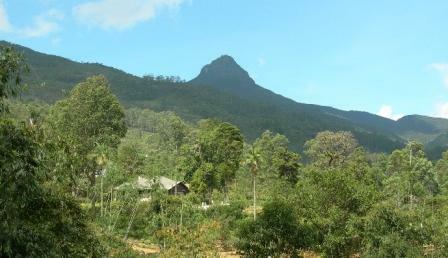 It was a four hour drive back to Kandy; here is a photo of the mountain as we were driving away. We were both tired and cranky (especially Helen!) by the time we arrived. After much indecision about dinner, Helen found some problem in everything I suggested, she made some noodles with tomato sauce, toast and a small salad. She was off to bed by 5:30 and I followed about 8:30. A woman followed us and gave us a little history on the film and mentioned that her husband had a small role in the film when he was nine years old. His mother was also in the film, in fact, they were the only Sri Lankans. All that remains are the holes for the bridge supports (see picture). The movie was released in 1957 and won seven Oscars including best picture. 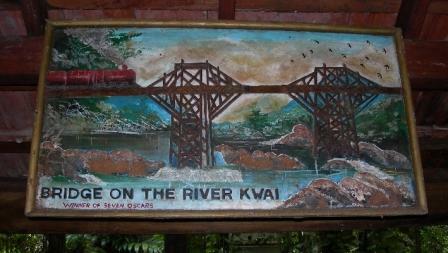 It is about the British blowing up a bridge in Indochina during World War II. 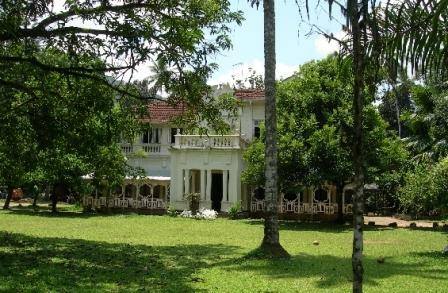 We’ll have to see it again when we get back to the U.S. Parts were also filmed at the Mt Lavina Hotel outside Colombo (we had dinner there) and the Peradeniya Botanical Gardens, which are across the road from the university. We had lunch at the Plantation Hotel. It was a five star accommodation, very nice, but seemed totally out of place for the poverty that surrounds it. As we continued on A7 we somehow missed the turn off to our destination. Try as we might, driving back and forth, we could not find it – not too surprising given that signs in general are lacking and many signs are only in Singhalese. 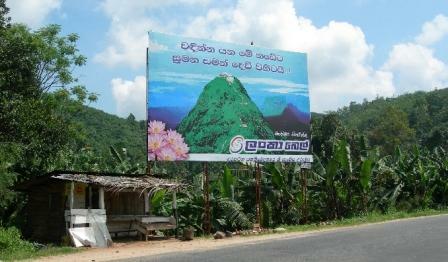 I did take a picture of a billboard advertising the mountain along the way. 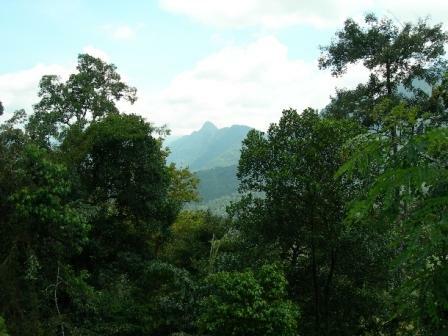 We decided to drive to Hatton, another access point, and approach the mountain from a different direction. When we arrived the sky opened up with a huge downpour. 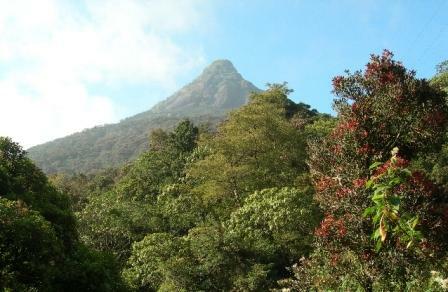 It did not look good for a climb but we decided to go to Dalhousie at the foot of the mountain where we had a reservation in the Green House guesthouse and just hope for the best. 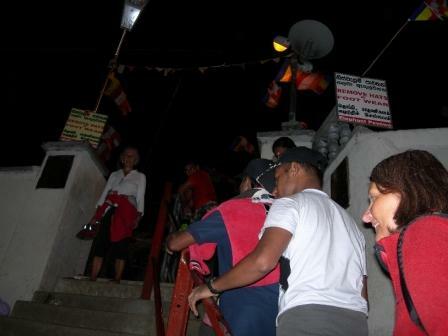 After some phone calls Brenda (a worker) met us at the bus station and had us drive to a little parking area among all the stalls catering to the pilgrims that come to climb the mountain. 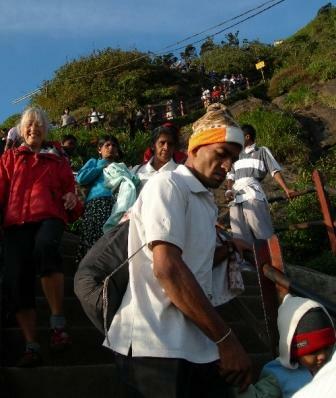 Brenda is 80 and has climbed the peak 72 times! She is planning on another trip up in May. I paid my dollar parking (security) fee and we carried our luggage about a quarter mile across the river and up some steep stairs to the Green House. The traditional pot of tea was waiting for us when we arrived at the Green House. There were six rooms and we had #1, there was no one else there. 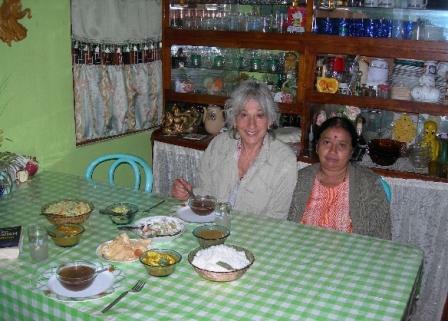 The owner’s wife and servants prepared an excellent Sri Lankan dinner with mild curries for our western palate. 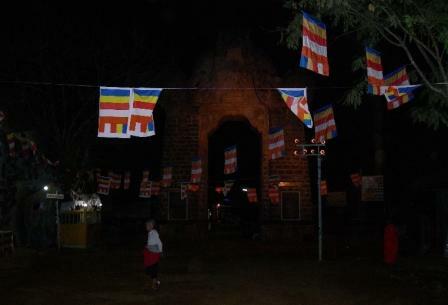 Afterward, we walked down to the start of the trail where there is one of many Buddhist shrines/statues. The weather was still cloudy and threatening rain. One Month to Go! Helen – This morning as we were eating breakfast and telling Ruki about Tom’s scrape with the three-wheeler; she got her driver/caretaker to use some rubbing compound on the red paint and got it off. I can’t believe it looks good as new. He was happy with the $2 that Tom gave him. 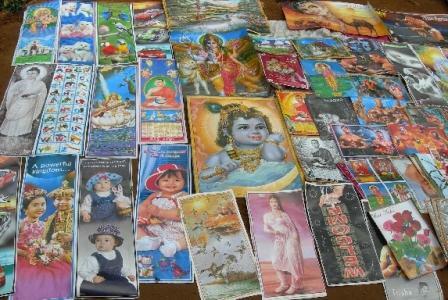 Tom- I had a really busy day today – picked up our China visas ($135 each! 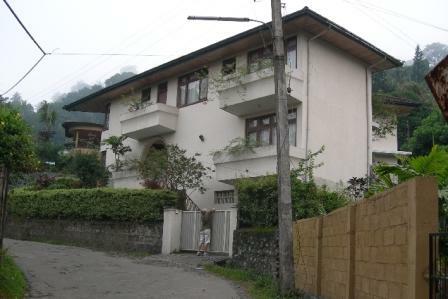 ), paid our last month rental on the car ($374), bought a Lonely Planet China book ($35), did a withdrawal at Hatton National Bank, spent an hour online at the Fulbright office and drove back to Ruki’s in the morning. I picked up Helen for lunch, made some wrong turns, and ended up at Ranjan’s framing store. We paid him for the two paintings he framed (elephant and lion fish $82) and he provided chicken rolls and iced coffee for lunch. We then spent another hour on the Fulbright computers and returned to the guesthouse. We ended the day by taking Ruki out to dinner at the Commons on Flower Road. I had a club sandwich and fries, Ruki had something called kottu rotti which was pretty good and Helen just had a chicken wrap, which was the most meager of the three. Helen and I shared their specialty – a Mango Milkshake! This was the first full day that I ventured out in Colombo traffic! Helen – Got out of bed at 5:30 to try an earlier walk around the lake, it was better but still not good with the fumes. 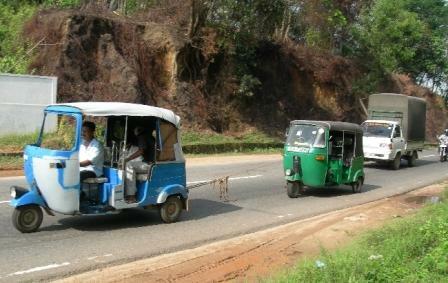 After breakfast and showers we were in the car for the 4 hour drive to Colombo – note the Tuk Tuk tow picture. We got to Ruki’s at noon and she had lunch ready for us, she is so very thoughtful. We had to be at the Fulbright at 2 for the Fulbright project summaries from both the professors and graduate students. Luckily Tom’s went well (same one he presented in India) but other’s had computer problems and the students went way over their time limits!! This ended a little after 5 and then we were to return at 7 for the reception which was for the Fulbrighters and local important people affiliated with the program including the US ambassador. We didn’t want to return to Ruki’s for the interim break so went to a local internet café with Jordon (the fellow from Texas Tech who went to India with us) where we had iced coffees and I used his computer to catch up on email. The reception was alright, the food was delicious even though not especially good for you, and we met some interesting people. We didn’t know about the parking at the Fulbright so we took a taxi there in the afternoon and returned by Tuk Tuk that evening. 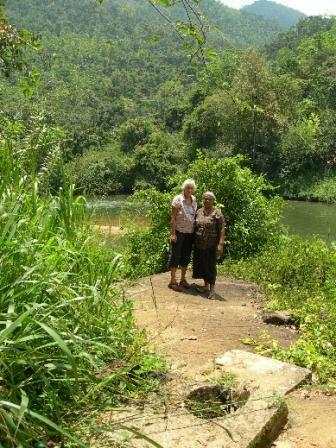 Helen – This morning we were out by 6:15 to walk around the lake which is about 2 miles. 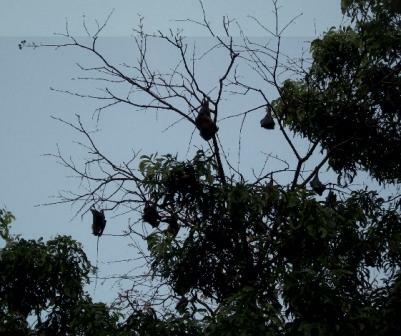 It is a lovely area with cormorants, pelicans, ducks, and bats (see picture). There is a dirt/concrete block path for walking but for most of the way is right next to a road which is heavily congested with cars and trucks. The fumes made walking quite uncomfortable and we decided to try an earlier time the next day. After breakfast, Tom went back to the university for several meetings and I stayed home to walk to Food City (about 1 mile away just off the lake trail) with my back pack for supplies. While I was gone, Shenani cleaned out a cupboard for me so I had my own space in the kitchen. I was able to do laundry while disinfecting the vegetables and preparing tonight’s dinner and lunch for the next day. I expected Tom home for dinner about 6 but he called to say he would be late because he again had problems setting up his computer at the university (same problem as at Ruhuna) and to expect him about 6:30-7. I began worrying about 7 because it was dark, and he came about 7:30; the traffic was still bad and he made a few wrong turns. As he went over his day, it was evident that they wanted to overwork him – with two two-day workshops and five one-day workshops in 10 days! Shamila wanted him to give one all day workshop to a group of women (her exercise group and perhaps others in the community) who wanted to lose weight. He seemed a little down so I suggested that maybe I could help with the women’s group. He was really hoping not to involve me in this part of the grant so I would have more free time to explore the area with Shenani. You are currently browsing the The Martin's Blog blog archives for March, 2008.